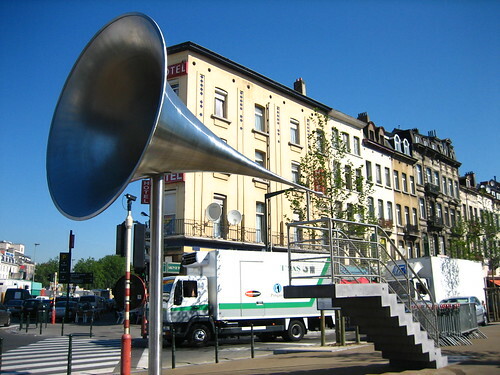 Located on the Avenue de Stalingrad, not very far the Brussels South Railway Station (Bruxelles-Midi/ Brussel-Zuid) in central Brussels, is a huge megaphone or speaking horn known as 'La Pasionaria'. The art work work dedicated to all migrants to Belgium was inaugurated on July 7, 2006 and symbolises/encourages spontaneous self expression. The name 'La Pasionaria' is based on the legendry Spanish heroine Dolores Ibárruri (lovingly known as La Pasionaria) of Spanish Civil War, who along with other Republican leaders used to give speeches of encouragement to the Republican soldiers in the battle trenches, using a big megaphone. Commissioned by Brussels' Committee of Urban Art, the megaphone is a creation of local artist Emilio Lopez-Menchero. It is 4 metres long with a horn diameter of 2.3 metres and is made of 10 mm thick stainless steel. The megaphone is probably World's largest Speaking Horn.